Form a loop in the rope. Pass the end through it. Pass the end through the loop again. Tighten the knot to make a secure stopper knot. Uses: The Double Overhand Knot (ABOK # 516, p 84) is based on the Overhand Knot with one additional turn. It creates a reliable, moderately large, stopper knot. Alternative Method: In addition to the technique shown in the animation, the Double Overhand can also be tied by threading the end of the rope through the coil as shown here. The Double Overhand provides the basis for other useful knots, e,g, the Double Fisherman's Knot and the Poacher's Knot or Double Overhand Noose. 1. The short end of the Figure 8 Loop Follow Through is tied around the standing end. 2. The short ends of the Figure 8 Bend are both tied around their adjacent standing ends. 3. 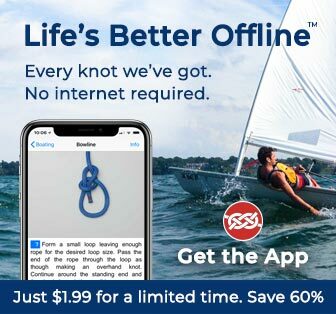 Unless under load, a Bowline can shake loose. To virtually eliminate this risk, the short end is tied round the adjacent part of the loop to make a Stopped Bowline. Other Stopper Knots: The Figure 8 may be the most widely used, especially in boating, but it tends to come undone. The Ashley Stopper Knot and the Stevedore both deserve to be more widely used and known. The Matthew Walker requires three or four strand rope because it is tied with the separated strands. Therefore, after the strands are reassembled and whipped it cannot be just "untied". Its greatest use may be in smart installations such as rope handrails. For slippery ropes the EStar Stopper is the best.